Content management systems (CMS) that controls the back-end of a website can make or break the success of your SEO implementation. You might already be familiar with Pixelsilk, an SEO-friendly CMS (which also happens to hosts BruceClay.com). Just in time for SMX West, Pixelsilk announces the launch of Search Advice 2.0, the newest iteration of tools that provide real-time search marketing wisdom in its CMS with the help of Bruce Clay, Inc.’s SEOToolSet®. Search Advice originally launched in 2009, and integrates specific reports within BCI’s SEOToolSet such as the Multi Page Analyzer and the Single Page Analyzer, right into the CMS for optimizing pages. 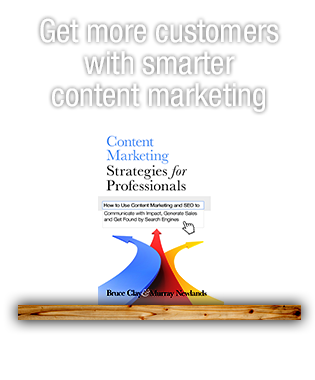 The original iteration provides insight on formulating the Meta information and the content structure based on the keywords being used. The 2.0 version that launches tomorrow adds three features to make on-page optimization even better by addressing important content issues such as the grade level and duplicate content, including duplicate Meta information. If you’re at SMX and interested in learning more about Search Advice 2.0 or how the SEOToolSet is integrated into it, stop by Pixelsilk’s booth, No. 308, or Bruce Clay, Inc.’s booth, No. 401. Writing for the Web requires ease of reading to keep it simple and engaging. Matching the grade level of your top online competitors can give you a leg up in your SEO. At BCI, we often talk about the idea of the “least imperfect” website. A least imperfect site is one of the top-ranking sites for any given keyword that seems to have addressed enough factors in Google’s 200+-factor algorithm; “least imperfect” because, well, it’s near impossible for one to hit all 200 algorithm ranking factors at once. Through our SEOToolSet, you can examine which characteristics these top-ranking sites for a keyword phrase have, and then try to match or beat it by performing tweaks to the site here and there. 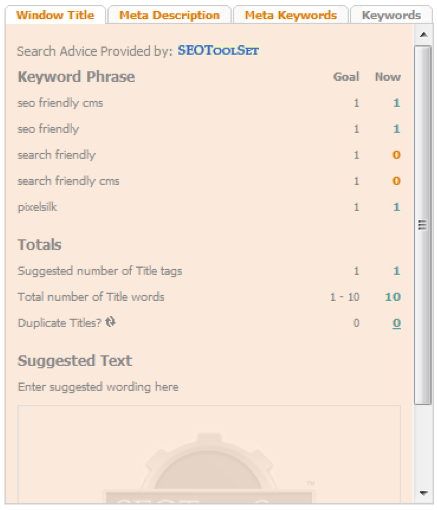 One of the features in our SEOToolSet incorporates the Flesch-Kinkaid Grade Level to show at what grade level your top competition is writing its content at, so you can use that data plus your own wisdom to understand which direction you should take the content you’re writing for the site. This function is now available in Pixelsilk’s CMS, so grading content on the spot is simple and easy, allowing for making adjustments on the fly. But remember, writing engaging content that speaks to your audience goes beyond just the grade level, which is why this function in Pixelsilk is meant to provide data which you then can use as a starting point for your content strategy. Just because your competition is writing at a 12th grade level, doesn’t mean you should. But without this data to begin with, you’re likely shooting in the dark. Duplicate content has always been a hindrance in SEO, made even more of a priority to avoid due to Google algorithm changes in 2011 that targets “scraper” sites. 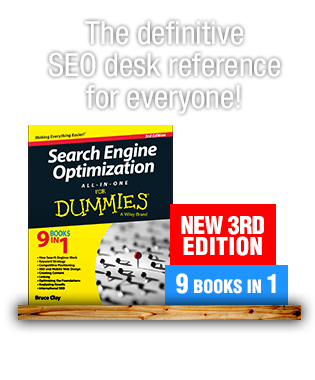 As you may know, search engines will pick one site over another to rank depending on which is the most relevant for that query. Unfortunately, some sites with original content can be filtered from the results if another site is considered more relevant for one reason or another. And it’s not just competitor sites that can be the enemy. Sometimes a website can be it’s own worst enemy. A Web page can be considered duplicate content even if it’s just the Meta information that’s the same. Many site owners have no idea that the time they think they are saving by creating the same Meta information across Web pages can actually harm their chance to rank. This is where two great new features come into play in Search Advice 2.0. The first is the integration of Copyscape. Copyscape is a Web content plagiarism tool that when integrated in Pixelsilk, will very quickly search out and display the top three matching Web pages for that content. The percentage threshold for duplicate content is customizable. The second feature that’s new in Search Advice 2.0 allows the Web page editor to run a tool that analyzes the entire website for duplicate content in the Meta information across all Head sections on every page. 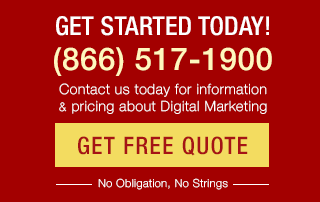 This allows for quick adjustments to ensure each page has the original content it needs for SEO. If you’re interested in learning more about the functionality of Search Advice 2.0 in Pixelsilk or the integration of the SEOToolSet, contact the SEO-friendly CMS team over at Pixelsilk at 541.317.3583 or the sales team here at BCI at 866.517.1900. What’s the most important facet to SEO?